This original article was first published in The Dot Connector Magazine, Issue #11. 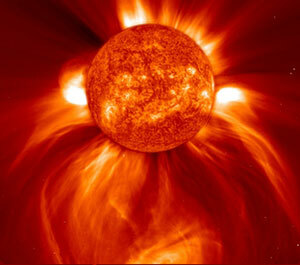 On August 3, 2010, a C3-class solar flare caused a coronal mass ejection that headed towards the Earth. The impact of the flare resulted in a G2-class geomagnetic storm that lasted almost 12 hours. The official story is that the storm caused beautiful northern lights to appear from Europe to North America. Well, that doesn’t seem so bad, does it? Nevertheless, there has been a lot of talk lately about solar flares and how a big enough solar flare directed towards Earth could knock out electrical grids. As we all know, sometimes the mainstream media talks up certain scenarios to scare everyone. Sometimes they just make things up entirely. In this case, I sat up and took notice because the power in southern Europe was flickering that night. Lights would dim in a pulsating fashion. That is a fairly rare occurrence. It is doubly strange because according to conventional wisdom, geomagnetic storms cause aurorae and electrical problems mostly in latitudes closer to the poles. Obviously, some investigation was in order. First, we need to understand a little something about sunspots, solar flares, and coronal mass ejections. The sun is really big, and really hot. It also generates powerful magnetic fields. Since the sun’s polar regions rotate more quickly than its equator, its overall magnetic field becomes warped. Sometimes, these powerful magnetic fields become concentrated in a single spot on the visible surface of the sun, known as the photosphere. The magnetic fields focused in one spot tend to “seize” the area, causing the spot to become cooler (and therefore darker) than the rest of the surface. Sunspots usually appear in pairs: one spot is like the North pole of a bar magnet, and the other spot is the South pole. The sun’s crazy magnetic field thus creates a “magnetic arc” of sorts that goes from the North sunspot to the South sunspot (or vice versa in the southern hemisphere). 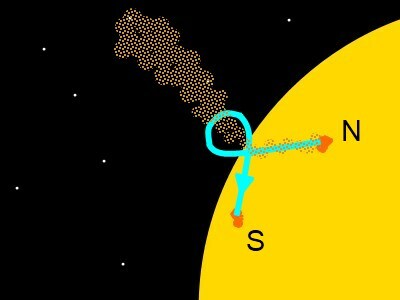 Material from the sun sometimes takes a vacation into space along these magnetic highways, from one sunspot to the other. This becomes what we call a solar flare. An M9 flare is 90 times more powerful than a C1 flare, and a C3 flare is 10 times more potent than a B3 flare. Now you know what those crazy classifications actually mean! Now, solar flares and CMEs can shoot off in any direction. Sometimes, they are aimed towards the Earth. When this happens, charged particles and all kinds of goodies go racing across the void and eventually smash into the Earth’s magnetic field. 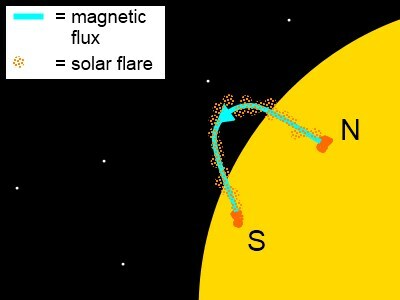 The so-called “solar wind” is basically the same thing only on a more continuous, lower level; if the solar wind is a gentle breeze, then solar flares might be thought of as stormy wind gusts and CME’s as hurricanes. Our planet’s natural magnetic field both captures and deflects these streams of charged particles, resulting in what is known as the magnetosphere. During solar flare and CME events directed towards us, lots of energy can get dumped into the Earth’s magnetosphere. This additional energy is like a power surge that distorts Earth’s “shields”, and it can cause all sorts of mayhem. Satellites can be damaged or pushed out of their orbits, radio communications can be disrupted, astronauts can be harmed, and, of course, we end up with attractive aurorae. All this crazy energy and these wild particles flying around can have serious effects on the earth and human infrastructure. They can produce geomagnetically-induced currents (GICs) in electrical conductors. The simple explanation is that the mayhem occurring in the globe’s magnetic field also results in abnormal electric fields near and in the planet itself. You might think of it like an electromagnet inducing an electrical current in a piece of copper, only, the copper in this case is the ground beneath your feet and the structures attached to its surface. So, solar flares and CMEs cause magnetic disturbances which in turn create an electric disturbance in and around the Earth. Great. The only question is: why does that affect things like power grids? After all, they are grounded for protection. Earth grounding means that your metal-encased washing machine is tied via your circuit breaker panel to a big conductive metal rod embedded in the ground. Any stray electrical currents due to malfunction will be safely conducted into the ground, and away from your hand. So what’s the deal here? The problem is that during a geomagnetic storm, geomagnetically induced currents in the Earth itself sneak through the very grounding wires that are supposed to protect power grids, creating problems. Normally, GICs will mostly affect very long conductive wires or other metal structures like pipelines. It just so happens that in places like North America, there are very, very long power lines. There are many power plants, and there are lots of power transmission substations. The power plants generate electricity; the wires carry it all over the place, and the transmission substations act like traffic cops, deciding which set of power lines the electricity is to be directed to. In recent years, power deregulation has resulted in tons of switching, power sharing, and even the selling of electrical capacity from one region to another. If Region A doesn’t have enough juice, they just buy some from Region B. Region B taps away on their computer, et voila! Loads of electricity is routed through substations and over long, very-high-voltage wires to Region A. Cool, eh? Well, not really. …[C]onnectivity loss is significantly higher, however, when targeting high degree or high load transmission hubs. The grid can withstand only a few failures of this nature before considerable parts of the network become disconnected leading to substantial connectivity loss at consumer levels. In other words, if only a few percent of the key transmission substations that are heavily loaded were to fail, 60% of the continent could end up without power. Power usually isn’t generated in your local area anymore – it can be generated, sold, and shipped off to distant cities. The paper also notes that cascading power failures could be a rather large issue. If one substation fails, it will increase the load on other connected substations. The added load on the connected substations then causes those facilities to fail, and so on. In the case of a cascading failure, only 2% of the key substations would need to fail to cause a 60% blackout, and an 8% failure rate would result in a blackout of the entire continent! Great – but what does that have to do with solar flares and GICs? When you have very long transmission lines carrying power all over the place, you need to send that electricity at a very high voltage to minimize transmission losses. So, you stuff the electricity through a gizmo known as a transformer, which kicks up the voltage before you send it off. At the receiving end, there is another transformer which drops the voltage back down to something more manageable before it is then sent off to Mr. and Mrs. Johnson’s house. The picture might be a bit clearer now. When GICs are created in the Earth, they can flow up the ground wire into a transformer (yup, that’s very backwards, and very bad). Transformers are very picky creatures, and they don’t like to become saturated – a technical way of saying “overworked”. GICs are more or less direct currents (DC), versus the alternating current (AC) of our power systems. 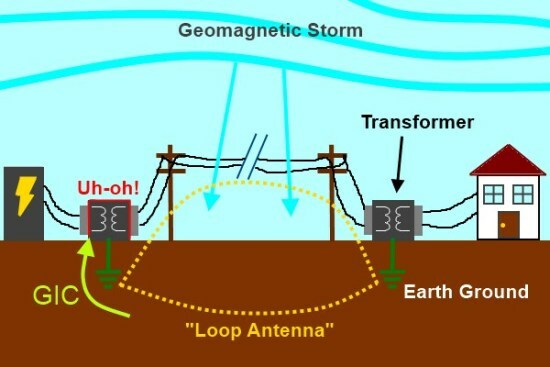 Transformers REALLY don’t like DC.2 The end result of a geomagnetic storm created by a solar flare or CME is that the power lines themselves connected through their earth-grounded transformers act like a big loop antenna. Current flows up through the ground, into the transformer, and it starts to get overworked. It huffs and puffs and sometimes, it gets so hot that the insulation inside melts. At some point along the way, safety systems kick in and oops! Blackout. Of course, there are other problems caused by GICs. High voltages can be created inside metal pipelines, leading to accelerated pipe corrosion and failure in older pipework. Railroad tracks are long metal rods, yes? How about those fiber optic cables that form the backbone of our communication networks? Well, short ones are okay because they aren’t conductive. But longer optical fiber lines have repeaters installed every so often. Repeaters are essentially optical amplifiers powered by electricity, which is – you guessed it – sent over wires embedded in the cabling containing the optical fiber! And that brings us to the point: No one really knows for sure! Space weather and its effects on the Earth and the technological systems of its inhabitants is a relatively young science. Even our understanding of the sun and solar flares is evolving as we learn more. Small storms have caused big problems in the past, and big storms have caused hardly any damage at all. It is true that power companies could spend, say, $100 million dollars to install simple protection against GICs, but even that is not a guarantee. A strong enough solar-storm could theoretically have very serious effects even with the proper protective equipment.5 No one knows for sure – that’s the bottom line. Then again, who knows… Maybe nothing will happen. There are so many factors that determine whether a given area will be affected by a given geomagnetic storm that it is very difficult to predict what will happen. Maybe we ought to just live through widespread blackouts lasting months or years, and then we’d break free of Big Oil and Big Electric and Big Brother, and come up with real solutions where everyone generates their own power safely and cheaply. Maybe we would learn that we don’t really need our “digital lifestyle” as much as we think we do, and we’d rediscover the joy of simply living and laughing together. 1 Albert R., Albert I., and Nakarado G. “Structural vulnerability of the North American power grid.” Physical Review E, Vol. 69, 2004. 2 Price, P. R. “Geomagnetically Induced Current Effects on Transformers.” IEEE Power Engineering Review, Volume 22, Issue 6, 2002, p. 62. Good points. What’s really needed are economic incentives that rewards real scientifically based development. The economic structure nowadays rewards cost cutting, quick profits, and just narrow minded short-sightedness in general. People think that somehow the market place will magically lead to an efficient economy, but this is only efficiency in the sense that the status quo is maintained, meaning a normal season of hurricanes, normal frequency of earthquakes, light solar flare activity, etc, and virtually the absense of extreme catastrophic events. But what happens when things get much worse than the market accounted for? Wham … the sh*t hits the fan and whole societies of people are caught off guard. So the solution is to somehow reward planning, development, and entrepreneurship that scientifically considers the real risks on a long term scale. Easier said than done, but not impossible if the genuises of the world would stop and think about it. But even with a real solution, good luck getting it to pass, no self preserving politician (means all of them) would dare propose such measures, especially nowadays with all the hoards of angry citizens with pitchforks and torches ready to lynch anyone that dares to go against the laissez-faire mentality that appears to be the popular sentiment of today. I do believe loose the digital life is not a bad option at all. Regain contact with nature. Nonetheless the transition will be painful and I will loose my digital life related job and hobby!